You don’t have to look hard to see examples of distracted driving on Maine roads. Next time you pull up to an intersection, take a look at the cars around you. Chances are you’ll see at least one person fiddling with their phone — talking, texting, emailing, checking their social media or doing who-knows-what-else. Even worse, you will see people doing the very same while driving down the road. Unfortunately, it’s not hard to see examples of this behavior leading to tragedy. had slid onto her passenger seat. She veered into oncoming traffic, striking two cars. Thankfully, everyone involved survived. Also last year, a Gorham man was distracted on his cell phone when he rear-ended another vehicle on I-95 in Hampden. His car caught fire, and the passengers in the other car had to be taken to the hospital. In 2016, a teenage girl drove through a red light in York while texting on her phone. An oncoming truck swerved to avoid her, causing a 10-car pileup. Four people were taken to the hospital. Again in 2016, a teenage girl was texting and driving in New Canada when she lost control of her car, slid off the road, went airborne and landed in some nearby trees. She suffered a broken neck. These are just a few recent examples of an increasingly common phenomenon on Maine and U.S. roads. Maine first passed a law prohibiting texting and driving in 2011. That year, Maine State Police wrote 48 tickets for texting and driving; in 2016 they wrote 866 such tickets. 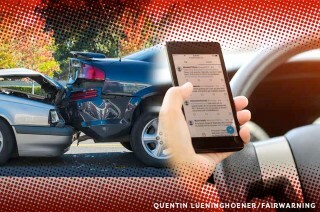 That same year, 365 crashes in Maine were attributed to texting or dialing on a cellphone. This is an issue on par with drunk driving. The issue today is that it is difficult for law enforcement officials to identify when someone is texting when they’re driving versus doing something else, such as dialing or entering an address into a GPS. When officers pull someone over who they believe is texting, that person can just say “no, I was dialing a phone number,” and there’s no way for the officer to know if they’re telling the truth. This has essentially taken the teeth out of our anti-texting and driving law. I have a bill in this session to fix this issue. LD 165 “An Act To Prohibit the Use of Handheld Phones and Devices While Driving” would do exactly what it says: ban the use of handheld electronic devices while driving in Maine. It makes an exception for hands-free devices and instances where someone is communicating with emergency personnel. The bill does not apply to two-way or band radios. This bill will make it clear for drivers and law enforcement officials alike: Fiddling with or using handheld electronic devices while driving is distracted driving, and it is dangerous. I am hopeful that it will be passed through the Legislature and signed by the governor. April is distracted driving month – let’s join all of the other states in New England, with the exception of Massachusetts, and 16 other states around the country banning hand-held electronic devices while driving. 287-1515 or diamondhollyd@aol.com. I work for you and my line is always open.